Vancouver is one of the most beautiful places in the world. It is no wonder that residents are happy to call this city home. With a population that is always on the rise, to is tough to find a little piece of this landscape to call your own. When you do get your hands on a home or workspace, there is more pressure than ever to keep properties in good condition. Routine property maintenance sounds simple enough, but these chores are easier said than done. When it comes down to those difficult to reach places like the heights of your property, call a Gorilla. Great results for chores like gutter washing and roof gutter cleaning are never out of reach for our experts. Despite how easy it is to put gutters and drainage systems out of focus, they are quickly becoming one of our most popular call-outs. With a climate like the one in Vancouver, there are many variables that contribute to the overall condition of properties. High winds shake debris from trees while heavy rains add excessive amounts of moisture to surfaces. In an ideal world, drainage systems would be clear enough to let water pass through and away from buildings but this isn’t always the case. Unlike some chores, gutter cleaning doesn’t need to be a weekly practice. Maintenance specialists highly recommend twice annual service for your gutter, eavestrough or perimeter drains. This level of care for exterior drains keeps your system in good condition throughout the year. If debris sits, it leads to the formation of foundation layers. Foundation layers contain heavier materials that fall to the bottom of pipes and drains. This layer prevents lighter debris from being washing through the system, piling up instead. This simple act opens to the door for water damage to your home. During heavy rains, water accumulates and sits within pipes and downspouts, paving the way for organic rot. This rot invites damage to your perimeter drain system, can negatively impact the condition of construction materials and even lead to pest problems. What is more inviting to insects and rodents than a cool, damp and covered place to call home? Instead of dealing with negative impacts, just call a Gorilla for gutter maintenance services during Spring and Fall months. Every day, property owners in the Vancouver area run down to home dept to investigate options for cleaning their gutter system. You might be able to rent heavy machinery for some chores, but your perimeter drains cannot be pressure washed. Instead of plunging your hand into the muck in your system or taking a chance on damage, call a Gorilla for professional results. There are plenty of options for maintenance firms throughout the Vancouver area, so choosing the right one is important. The team at Gorilla Property Services are local to your area and only accept the best results for our communities. While our experts specialize in large-scale strata and co-op eavestrough washing, we have a residential home team as well. Just clearing away clogs and blockages is not enough to equal a fully cleaned system. Once hard materials are gone, there are still black streaks, dirt and grime left behind. The difference between a passable job and a great job is taking the time to properly remove mildew stains. 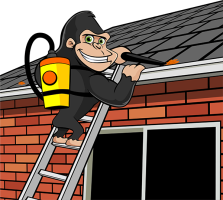 Leave your eavestrough cleaning in the capable paws of our Gorillas. Our specialists only use the best in safety equipment to keep properties and staff safe. Reaching heights is only possible by using stand-offs that are secured. Vacuums are used to clean both opened and unopened areas of your drainage system, along with downspouts. When you call in a professional service, there is no debris, large or small, left behind. Each property goes through tests using water before specialists pack up their tools. If you have never seen a properly cleared eavestrough, don’t worry! Each Gorilla carries a smart phone or camera in order to give our clients a proper ‘before and after’ view of their services. We provide expert gutter cleaning in Vancouver and are ready to help you. Call us today!